Saving the world… by yourself. Deep Silver Volition, the developers behind many important staples in the gaming world had at last revealed their next important new IP at this year’s E3. To many people’s surprise it was in fact a Saints Row spin-off they called Agents of Mayhem. So entirely new? No, but it’s so radically different with its futuristic settings and brotherhood mentality, that calling it a spin-off doesn’t always feel comfortable to say. Funny enough, this new spin on reality about a small group of individuals fighting together in a three-person group that the player controls, was actually inspired by comic books and superhero movies that have taken off so steadily over the last decade. 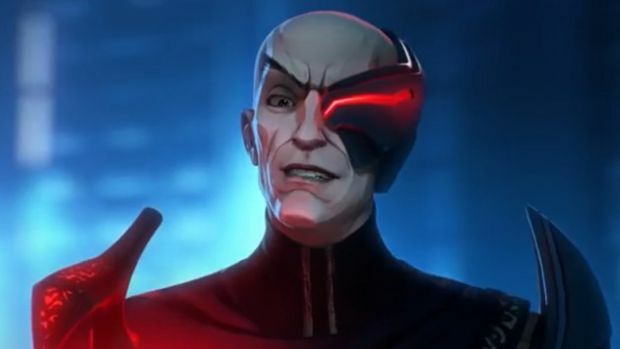 Volition have gone so far as to state that Agents of Mayhem is actually “their own comic hero universe.” These heroes within the game have been recruited from all over the planet to save the city of Seoul, South Korea from LEGION (League of Evil Gentlemen Intent on Obliterating Nations) — yes, it’s a bit of a stretch, but that wackiness shows just what type of game this third-person, fast paced shooter is aimed for. "These heroes within the game have been recruited from all over the planet to save the city of Seoul, South Korea from LEGION (League of Evil Gentlemen Intent on Obliterating Nations) — yes, it’s a bit of a stretch, but that wackiness shows just what type of game this third-person, fast paced shooter is aimed for." 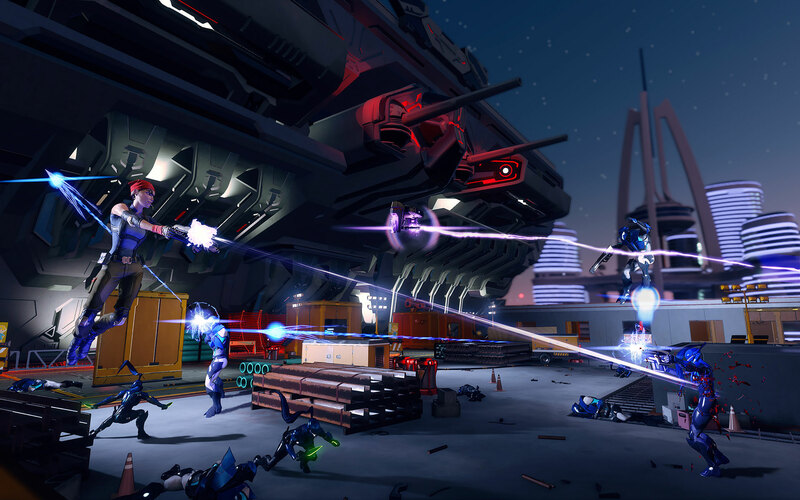 Where other games often take the player on a journey with a single character that learns every technique, becomes the ultimate soldier, and saves the entire planet all on his/her own, Agents of Mayhem isn’t quite like that. You are on a mission to save Seoul, but not with a single character that becomes the ultimate weapon. You get to choose a group consisting of three members. Within the E3 demo there were just a very short list to choose from. It isn’t clear if more will be featured later on, but here’s hoping. Each character has different weapons and abilities so mixing and matching your team will come in very handy for different situations down the line. There’s the obligatory assault rifle character, along with a bow and arrow female and so on. Within the empty city of Seoul — mind you this was a very early demo and not much happening within the demo limits — armored enemies are swarming around the city from LEGION doing their own dirty deeds, trying to complete agendas and what not. The shooting is very fast paced, as I mentioned, and keeping up with the enemies is a lot cooler and more fun than in many other shooters that I’ve played. 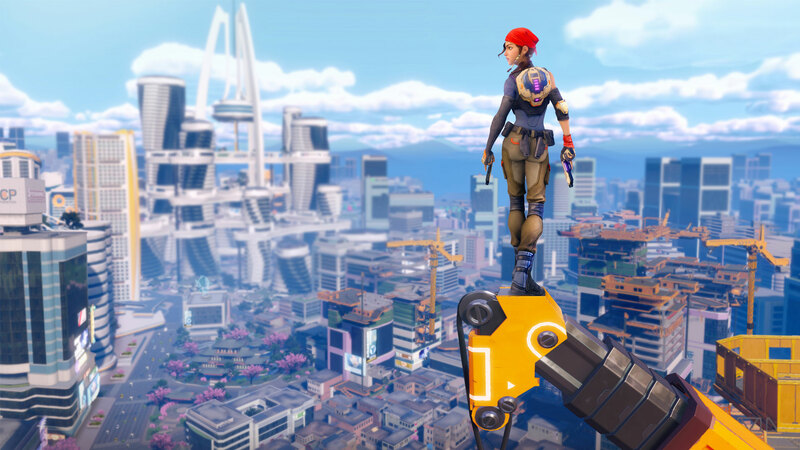 In Agents of Mayhem, there is no cover-based mechanics, instead you will have to constantly keep moving around to kill the enemy, and most importantly survive. This was purposely implemented within Mayhem to keep the game extremely fast paced and always moving towards the finish. There isn’t a moment to spare within the game as hordes of soldiers are constantly teaming up trying to take you down and conquer the city for their leader. "There are tasks to complete during the game as well. It’s not just about shooting — though that feels like the main focus." What’s cool is that while you’re in the game there’s an awesome ability to change characters with just the click of a button. These different characters are based on a three character team you design before the start of the mission. If they are interchangeable later on that’s still not clear. So if you run out of ammo (which isn’t likely), or you just aren’t getting the range you need from one of your character’s weapons, or you need to try a new strategy, you can instantly switch out to a new character and keep the battle moving quickly. There are tasks to complete during the game as well. It’s not just about shooting — though that feels like the main focus. Securing locations, collecting containers and destroying items within a certain area will allow other platforms to start moving, or will initiate a cut scene that will move the player onto a new area. The style of Agents of Mayhem is pure fun. With its bright colors, sarcastic and very witty humor, there’s no telling how far this game is willing to go to get the player to laugh. Nothing is serious within the game and that suits this title and makes it feel as though it has sustainability to being in the gaming market for a long time; and possible a new staple in the gaming world. "The fact is that there is no multiplayer for this game. It completely boggles my mind on why the developers have chosen this path." This game screams multiplayer and co-op multiplayer. However, that’s where Agents of Mayhem falls completely short. The fact is that there is no multiplayer for this game. It completely boggles my mind on why the developers have chosen this path. When it’s all said and done, Agents of Mayhem is an extremely limited shooter with no cover based mechanics or anything at all that makes it more than a small challenge. I had a blast playing it, but I don’t know how fun the final product would be. If new mechanics and gameplay styles are introduced and possibly a multiplayer or co-op mode, I could see this game going far. As of right now it is promising, but not practical.